What is it about water that attracts almost everyone? 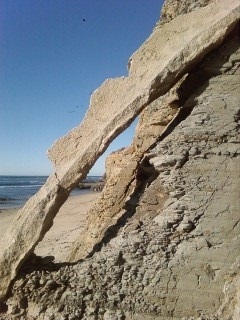 Some sort of primal need that recognizes the healing and restorative power of the water itself. The Sunset Cliffs Natural Park Advisory Committee met Monday, January 5 at the Cabrillo Rec Center. The recent tragic events set a somber note for the evening, as the Recording Secretary, Larry McCleary, presented the OB Rag article describing the circumstances of Barry Ault’s tragic death. The business of the evening got an early start with a discussion that came from the public comment period, plus a presentation requesting a practical approach to erosion which resulted from the mid-December storms, specifically the deterioration of the swale below the parking lot. 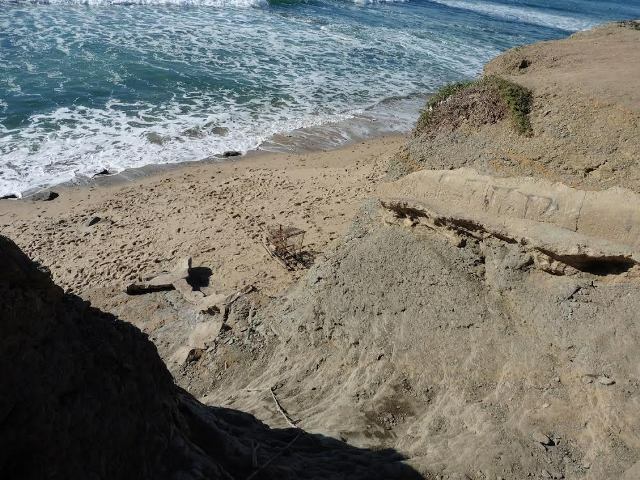 If you visit the Ladera Street portion of the Park, and walk closer to the edge of the cliff (but not too close), you see a dilapidated cement channel which runs all the way down to the beach. It is unknown if this swale ever seriously contained the amount of water that follows it during a heavy rain. 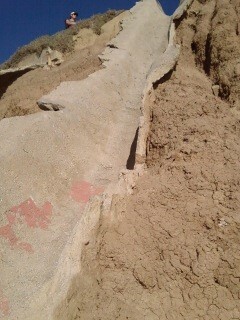 The lower end of the swale has broken off and was last seen on the beach. It obviously isn’t going to do what it was intended to do. It will be redundant when the final plan is implemented; what to do now is the question. The process for the full drainage system is starting and is a long way from fruition in any construction to solve this problem. Of course, the City Council member has a representative at the meeting, and we met for the first time Conrad Wear, Lori Zapf’s rep to the Ocean Beach and Point Loma. Although he did not say so, it was quickly pointed out that he is the son of Byron Wear, the former city council member for this area, and probably didn’t appreciate the jokes about asking his dad for advice. Office David Surwillo also was there, joining the members in their frustration at the dangers associated with the cliffs. On a more mundane topic, he addressed directly the RV Ordinance. Although feelings still are high on both sides, this is a done deal. If you want to report a vehicle in violation of the Ordinance, call the normal non-emergency Police number (619-531-2000) and it will be processed. Some original ideas that were floated included a web site to report, or a compliance form to fill out- are, not the approach that was implemented. Another item addressed by the committee was a request for input from the peninsula Peninsula Community Planning Board as they plan to address the question of adding crosswalks at the cliffs on Sunset Cliffs Blvd. for pedestrians. The Council did not take a position, as there were problems associated with this point of view – namely, there is a sidewalk on the east side for pedestrians, but no safe place to land safely on the other side, only parking lots and guard rails. If you have an active interest in the placement of cross walks near the cliffs, check the agenda for the PLPB meeting the third Thursday of each month, 6:30 at the Point Loma Library. Several people noted the large number of visitors over the holidays, many speaking unknown foreign languages. The introduction of this lovely yet wild spot to international travelers via the internet, a matchmaking service between sightseeing and sunsets, lures many to this spectacular location. Interesting…what is the salary of this young lad?